Welcome to our online magazine. 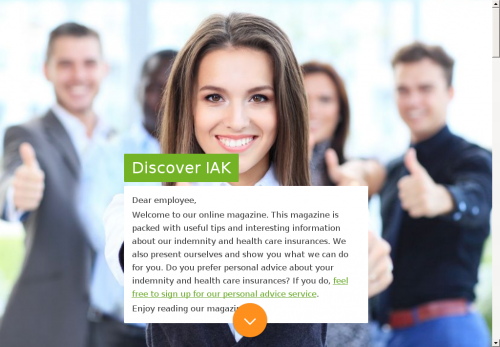 This magazine is packed with useful tips and interesting information about our indemnity and health care insurances. We also present ourselves and show you what we can do for you. Do you prefer personal advice about your indemnity and health care insurances? If you do, feel free to sign up for our personal advice service. IAK purchases insurances from virtually all Dutch insurance providers. We can always advise you on which insurance best suits your personal needs. You can come to us with questions about your policy. For example, when your personal situation changes due to family expansion, relocation or a new job. Besides great health care insurances we also offer car, home, travel and legal assistance insurances, offering you the benefit of appealing package discounts. Our financial experts will also be happy to help you with your financial planning and mortgage advice, so can be sure you build up sufficient pension rights and select the mortgage that suits you and your situation. Choosing a health care insurance is often quite complex. IAK offers advice and a comparison of different health care insurances based on quality, prices and reimbursement. You can always find the health care insurance that fits your personal situation. Benefit from collective agreements between your employer and IAK. Our advisors are happy to answer any questions you might have. When you take out multiple insurances from different categories via IAK, you will benefit from package discounts of up to 12.5%. Do you prefer personal advice about your indemnity and health care insurances? Feel free to make an appointment. IAK offers you advice about insurances and about your mortgage. IAK is an independent and accredited mortgage consultant. Buying a home is one of the most important financial decisions in your life. We are happy to help you with that decision. Together with you, we choose the mortgage provider and the terms that fit you best, so you can enjoy your home with confidence. Make an appointment for a free exploratory talk. Do you know if your private insurances are still up to date? Think about, for example, your car, home, home contents, legal assistance or continuous travel insurance. We are happy to help you find out. You should only insure what you really need to insure. Prevent unnecessary insurances, excessive premiums, a coverage that is too low and unexpected cost of damage. IAK's involvement goes beyond providing services. We are at the heart of society and we would like to add value to society. For example, by rolling up our sleeves. Through financial support from the IAK Fonds (IAK fund) and by movement with our customers during the IAK City Run, part of the Eindhoven Marathon. If you have any questions, please contact our Customer Service consultants at +31 (0)40 261 18 21 or klantenservice@iak.nl. We are available on weekdays between 8.30 and 18.00. Do you prefer contact in person? Would you rather make an appointment for a personal conversation with your IAK consultant? Call or email your IAK consultant via (040) 261 18 21 or send an email to klantenservice@iak.nl. Our consultants also offer open consultation hours for a variety of collective groups. Would you like to make an appointment for personal advice? Feel free to sign up. Our desk staff will be happy to assist you. Free free to visit Beukenlaan 70, 5651 CD, Eindhoven without appointment from 8:30 to 17:15. Do you work at the High Tech Campus? You can also visit our Service Desk at The Strip (above the Albert Heijn supermarket). We are available from Monday to Thursday between 11:30 and 13:30. Building Code C, 5656 AE Eindhoven.